This special eye cream contains an active complex that has been shown to help relax muscles and firm the skin. These actives combined with Eye Pro™ 3X complex which is shown to increase oxygen consumption in cells. 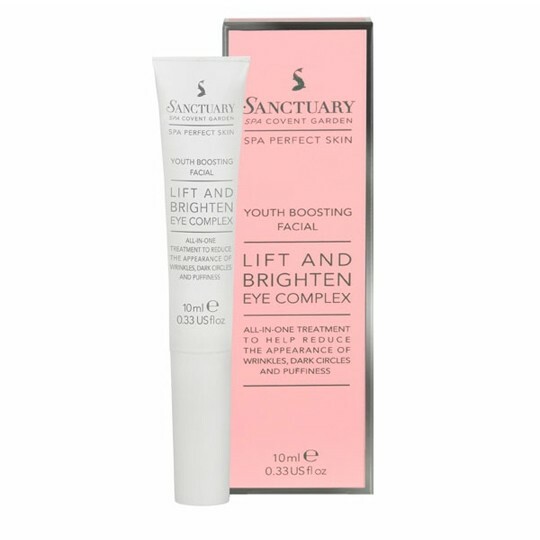 Helps to improve the appearance of dark circles and puffiness, leaving the skin looking lifted, firmer, brighter and younger. 1. After cleansing apply a few dots of the cream around the eyes and smooth over fine lines with the spatula applicator. 2. 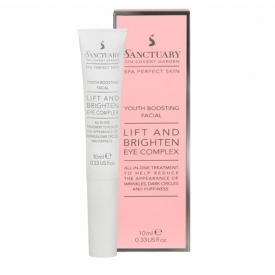 Finish with a Sanctuary moisturiser. Therapist's Tip: Use morning and evening, but be sure to wait until the cream is fully absorbed before applying make-up. Marine complex, kalpariane and ambre ocean spray stimulates collagen synthesis and firms & strengthens skin. Deepaline is an active ingredient derived from hydrolyzed wheat protein, shown to have muscle relaxing properties, reduces the appearance of wrinkles. Eye Pro™ 3X Complex is shown to increase oxygen consumption in cells, reducing puffiness and revealing brighter looking skin. Full Ingredients List: Aqua (Water), Glycerin, Caprylic/capric triglyceride, PEG-8, Silica, Cyclopentasiloxane, Sodium polyacrylate, Petrolatum, Cetearyl olivate, Betaine, Cyclomethicone, Phenoxyethanol, Sorbitan olivate, Palmitoyl hydrolysed wheat protein, Pentylene glycol, Polysilicone-11, Saccharomyces cerevisiae extract, Caprylyl glycol, Dimethicone/vinyl dimethicone crosspolymer, Disodium EDTA, Lecithin, Chlorphenesin, Palmitic acid, Sodium hydroxide, Alaria esculenta extract, Alcohol denat., Magnesium ascorbyl phosphate, Tocopheryl acetate, Pelvetia canaliculata extract, Rhodiola rosea root extract, Camellia sinensis leaf extract, Retinyl palmitate, Benzoic acid, Sorbic acid, Dehydroacetic acid, Ethylhexyglycerin, Polyaminopropyl biguanide. Trying products that improve the eye area is a bit of interest as I seem to suffer from dark circles and wrinkles no matter how much rest and sleep I get. This cream is light and eaily absorbed but the spatula makes application slightly difficult (for me anyway). I understand the reasons to use it but I find the roller ball approach of other products easier, quicker and much more even in application. Beyond that it's a nice product but doesn't produce any dramatic results. A nice treat but maybe not for everyday.